What's the coolest way you've decorated with fabric? Let us know in the comments! 1. Hang some pretty fabric, like a scarf on the wall for instant and cheap wall art. 2. Hang a giant tapestry to create an accent wall. 3. Staple wood beams to to colorful fabric to create custom framed art. 4. Wrap canvases in fabric to occupy more wall space. 5. Did you know you can make a giant rug from a piece of fabric? And it's inexpensive, too! 6. Make your own roman shades from unique fabric and mini blinds. 7. Stenciled two flat sheets to create one-of-a-kind curtains. 8. Use fabric to create a no-sew valance for a simple window treatment. 9. Hang fabric from a rod on the ceiling to achieve this Moroccan-style look. 10. Dye and hang fabric straight from the wall for an indoor canopy. 11. Use comfy fabric to sew your own throw blanket, like this faux fur one with tassles. 12. Make a floor pillow from an old blanket. 13. Or use a sweater to make a cute ottoman! 14. Use fabric to decorate a lampshade in a colorful print. 15. Use fabric and pens to make these Moroccan-inspired coasters. 16. A drying rack + fabric = this DIY magazine rack. 17. Or hang your magazines from the wall with fabric and a dowel. 18. Use an old dress with a fun print to cover a pillow. 19. Create some no-sew envelope pillows from cloth napkins. 20. This looks simple enough - tied scarves around your couch pillows for a boho-look. 21. Turn your Mexican blankets into fringed pillows. 22. Wrap couch cushions in beautiful a blanket, like this Serape one for instant color. 23. This is some black diamond-level crafting, but you can make your own sofa slipcover from fabric of your choosing. 24. Line a wood serving tray with fabric. 25. Decorate the dining room with textural placemats, like these dip-dyed pieces of fabric. 26. Add fabric flair with cloth napkins, like these DIY palm leaf ones. 27. Use raw fabric as a table runner. 28. Create your own serving plate with decoupaged fabric. 29. Create chair cushions to add contrast to dining seats. 30. Or simply wrap a scarf across the back of your chairs. 31. Use fabric to decorate your dining room by making a floral lampshade to go over your table. 32. Add strips of fabric to your light fixture for a unique fabric chandelier. 33. Learn how to make your own curtains from home decor fabric, like these hidden tab drapes. 34. Create a fabric basket to hold your keys by the door. 35. Create simple hallway art by framing a scarf. 36. Or hang colorful or dyed fabric in embroidery hoops. 37. Make your own hanging banner from fabric and vinyl. 38. Add flair to framed art by wrapping picture mats in fabric. 39. Wrap accent shelving in fabric for pop. 40. Wouldn't these fabric-coiled planters look cute by the front door? 41. Hang plants in cute fabric plant hammocks. 42. Create a coiled rug from fabric scraps for your entryway. 43. Or hand-paint a rug on a drop cloth. 44. Use fabric to decorate your stairwell! 45. No-sew cafe curtains add color to an otherwise bland window. 46. Or try this more classic no-sew rolled valance. 47. Keep an eye on the time - decoupage fabric to a clock face. 48. Use fabric to decorate a planter using Mod Podge. 49. Cover your command station cork board with fabric. 50. Decorate your kitchen with fun tea towels, like these stenciled ones. 51. Or maybe stamping is more your style. 52. Don't be bland - make some colorful pot holders to adorn your kitchen. 53. Or a cute skillet handle cover for your cast iron. 54. Personalize your kitchen by making a customized kitchen rug. 55. Line your cabinets in fabric for a pop of color. 56. Sew your own laundry basket with a fun fabric print. 57. Or learn to turn any basket into a laundry hamper by creating a liner. 58. Totally disguise your unsightly laundry area by hanging a large curtain. 59. Hide the pipes under the sink (and create more storage space) by putting a skirt around your pedestal sink. 60. Make your own shower curtain from the fabric of your choosing. 61. Add fabric dots to your shower curtain for a fun look. 62. Or try the ruffled style with this DIY. 63. Add texture and color to your office space by dyeing a fur throw. Source: The Magic Brush Inc.
64. Create customized window treatments that don't require any sewing. 65. Try your hand at some fabric appliqué art. 66. Use fabric to decorate clipboards to stay organized in style. 67. Take your organization to the wall with fabric book slings. 68. Give your dull ceiling fan a makeover by adding fabric to the blades. 69. Decoupage your boring shelves with a happy print. 70. Line the back of a bookcase with fabric-covered boards. 71. Cover storage bins in fabric. 72. Create cute felt storage cubes to keep all your supplies in once place. 73. Or try these coiled fabric bowls made from scraps. 74. Make desk organizers from fabric and old tin cans. 75. For larger objects, try this fabric bin DIY. 76. Decoupage your office chair in fabric. Source: Live Free Creative Co.
77. Update your butterfly chair with fabric of your choosing. 78. Learn how to make fabric tape to organize and coordinate your office life. 79. Cover your mousepad in pretty fabric. 80. 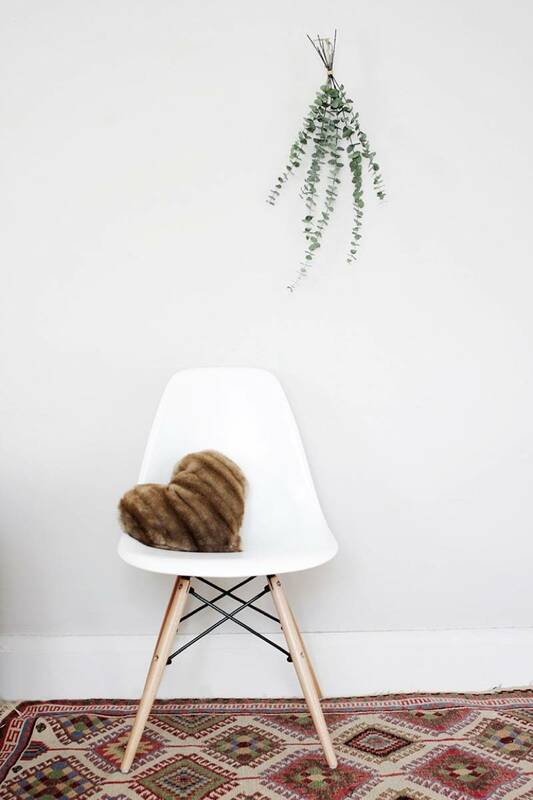 Create a cute heart-shaped pillow from faux fur. 81. Make a lumbar pillow from a table runner. 82. Or learn how to make standard pillow cases from any kind of fabric. 83. How about a DIY bolster pillow? 84. Customize your pillows with iron-on vinyl fabric. 85. Hang fabric to divide a room. 86. Cover a tray in colorful fabric for breakfast in bed. 87. Line your dresser drawers in fabric. 88. Or cover the front of your nightstand or dresser. 89. Did you know you can decoupage dresser knobs in fabric? 90. Wrap your clothes hangers (because why not!). 91. Hang a large tapestry behind your bed for a makeshift headboard. 92. Using dowel rods, you could replicate this dramatic fabric canopy. 93. Cover a lampshade in a cardigan sweater. 94. Create a hammock chair from sturdy fabric. 95. Make your own throw blankets, like this ruffled throw. 96. 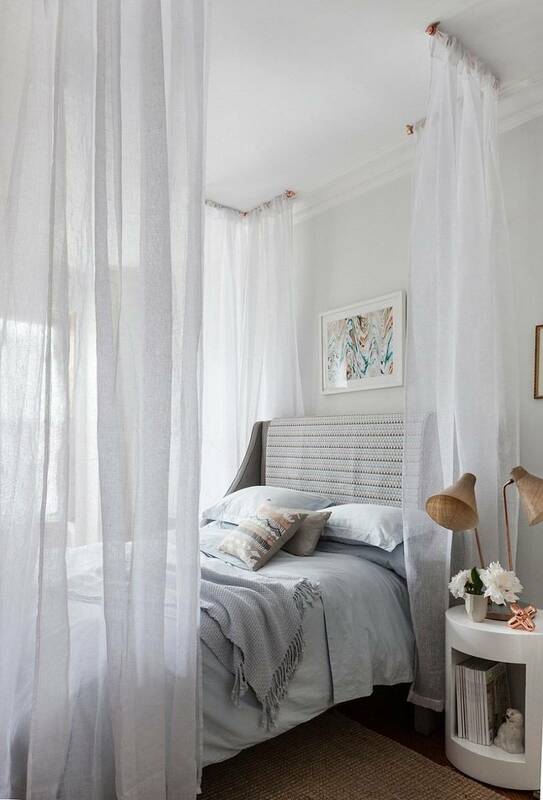 Get dreamy by fashioning a canopy bed. 97. Need more privacy? Cover your windows in this lace treatment. 98. How about you use fabric to decorate your walls? Bonus: This treatment is reversible. 99. And finally, create a removable bedskirt using fabric and velcro. Now that you know how to use fabric to decorate your whole house, check out our mega roundup of outdoor projects you can totally DIY!